With a price tag of only $80 and included FPV monitor, the Lieber Birdy 1060 seems to be a good deal. According to the manufacture’s specs, the Birdy-1060 has 3 flight modes, but it is not clearly specified if it refers to speed rates or real flight modes (like: Angle, Horizon and Acro). 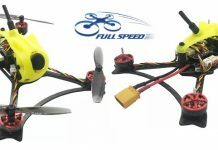 In order to make it safe for indoor flights, just like the popular Tiny Whoop drone, the Lieber Birdy 1060 also adopts ducted propellers. On top of the protective canopy is located the 600 TVL camera with integrated 25mW, 40CH, 5.8G video transmitter. Powered by a 430 mAh battery, the flight autonomy is pretty nice. As stated in the product description, it can stay in the air up to 6 minutes. About 5~6 minutes of flight time. 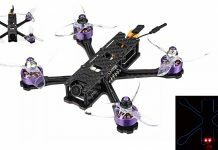 Although the Lieber drone brand is totally new for me, I found on their website a couple of other interesting drones. My favorite one, is the LB-8110 professional grade eight-motor UAV.